British banking officials announced Thursday that the London interbank offered rate — better known as LIBOR — will be phased out by 2021, ending a banking era and raising questions about how the reverse mortgage industry will replace the standard. LIBOR has served as the backbone of adjustable-rate Home Equity Conversion Mortgages for nearly a decade, forming the benchmark for expected rates and rate adjustments. And with ARMs now dominating the HECM space, the shift will eventually have a major effect on the way reverse lenders do business. The Department of Housing and Urban Development first opened the door to LIBOR-based loans in October 2007, and the standard soon overtook the previous benchmark, the Constant Maturity Treasury (CMT) rate. “Nearly all HECM ARM business has been tied to the LIBOR indices over the last decade,” Dan Hultquist, director of learning and development at ReverseVision, told RMD in an e-mail. But the standard has been fraught with controversy over recent years: Because LIBOR is based on self-reported interbank rates, the numbers were always susceptible to inaccuracies, and several participants were revealed to have been lying about their numbers to mask problems or gain an advantage. Back in 2008, as Bloomberg points out in this detailed history of LIBOR, the Wall Street Journal reported that banks were purposely fudging the numbers to hide the coming financial crisis. “Insiders knew that the market for interbank lending had dried up, meaning banks were essentially making up their figures each morning,” Bloomberg notes. Since then, major banks — including Barclays — have paid a total of $9 billion in LIBOR-related fines, according to Bloomberg, and former UBS and Citigroup trader Tom Hayes was sentenced to 11 years in prison in 2015 for illegal LIBOR manipulation. The Financial Conduct Authority, which oversees LIBOR, didn’t draw a straight line between the recent chicanery and the benchmark’s 2021 death letter, according to a New York Times report, but chief Andrew Bailey did give an example in which rates for a specific type of deal were submitted daily — despite only 15 representative transactions of that type occurring in all of 2016. “In our view, it is not only potentially unsustainable, but also undesirable, for market participants to rely indefinitely on reference rates that do not have active underlying markets to support them,” Bailey said, according to a transcript of his speech. The Times posited that LIBOR will be replaced by a metric that relies more heavily on actual loan interest rates and not self-reported figures, floating the Sterling Overnight Index Average — or SONIA — as a potential understudy. When asked how the reverse mortgage industry would react to LIBOR’s demise, Hultquist said he anticipates that lenders and HUD will eventually select a new benchmark, or simply use the CMT for new adjustable-rate HECMs and the 10-Year Treasury for the expected rate. 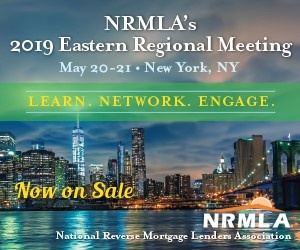 The National Reverse Mortgage Lenders Association emphasized that the industry and regulators still have a while to figure out a replacement plan. “This benchmark will phase out by 2021, and we look forward to working with all appropriate stakeholders in ensuring that a meaningful benchmark is in place before these changes take place,” NRMLA executive vice president Steve Irwin said in a statement e-mailed to RMD.